Glentruim from the air film coming soon! Here's a little glimpse of what our drone pilot is up to at Glentruim this week. We can't wait to see the finished film. Come back soon and see Glentruim from the air! What better way to start married life than with a Highland Piper piping you out after the marriage ceremony. Tipis On The Lawn for The Marriage of Nicola and Sandy - stunning! 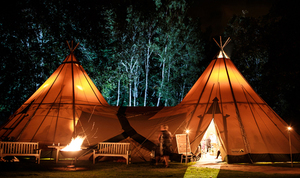 Tipis make a unique and romantic alternative to a marquee for a woodland wedding on Glentruim Estate. The marriage ceremony of Lauren and Billy was a truly romantic and intimate affair in this lovely little room. May Weddings A Huge Success. The month of May saw Glentruim Estate host the weddings of four lovely Brides and Grooms. Generally, the weather was kind to them, with one couple even managing to get married outside! We wish all of the couples much love and great happiness in the future. We are ready to welcome you to Glentruim Castle. The newly decorated Drawing Room at Glentruim Castle. Glentruim is a great place to come and see red squirrels, right from the window. This picture was taken this morning from the Coach House. Or chill out by this fireside! Alex Treadway is photographing the estate this week and updating the new website - here's a new picture of the smoking room. We had a photographer here yesterday, he took this from the top of Creag Dhu. From all of us in the snow at Glentruim we wish you a very happy new year! Approaching Glentruim in the snow (Gate Lodge on the left). Glentruim has a new logo. The Osprey is indigenous to the Cairngorms and can regularly be spotted. The new Glentruim logo features an Osprey which can easily be seen in the Cairngorms.